The second article I wanted to share with you was about Tyron Smith of the Dallas Cowboys. In this article we learn that Tyron Smith was also in a tough situation similiar to Jack Johnson of the Columbus Blue Jackets, but he decided to handle things a little differently. In only his second year in the NFL, he had promised to buy his parents a new house with a budget of $300,000. His mom and his stepfather came back to him letting him know that they had picked out a new house. The price on the house? A mere $800,000 and “only” $500,000 over the originally agreed upon budget. And that’s when everything started to change for Tyron Smith. If you remember in the story about Jack Johnson he had given full control of his finances to his parents after firing his agent. Tyron Smith did the exact opposite in this situation, having both his lawyer and financial advisor present during any process that involved money. He grew up working in the family business, but was frequently excused on the weekends when he started playing football. He thinks this may have started his problems with his siblings later on. 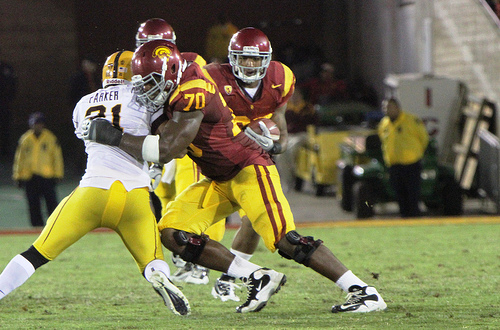 Eventually he was given a scholarship to play football at USC and started receiving serious attention from NFL scouts. After signing his initial contract he bought his mom a Range Rover, said he would pay off the family mortgage and eliminate all their debts. It’s not like Tyron was being cheap or anything, and all of these seem like reasonable ways to treat your mom and family after all they had done for him growing up. They wouldn’t be living the high life or anything of that sort, but it would be much more comfortable with a new car and no debts to their name. Unfortunately Tyron later found out that the way that the money was not used for those purposes. And soon his family started demanding for more expensive gifts from him, asking him to fly out “friends” of theirs to watch games and stay in hotel rooms. He kept transferring the money and its estimated that his family received around $1 million over the course of a year. That was up until Tyron received the phone call from his Mom about the new $800,000 house they wanted – costing more than the house that Tyron himself lived in. Smith and his girlfriend were forced to put up restraining orders against his sisters and other family members as they received threatening phone calls and e-mails after the line had been drawn at the house. Now we don’t know both sides of the story here, but with things like that it seems to paint a dim picture for that side of the story. We also learn more about Smith as he struggles with wanting to just keep the loving relationship with his family and not having it be about money. He knows that the career of an NFL player is extremely short and that many players end up bankrupt, and I hope that his family can see that side of it as time goes on. The article goes into further detail describing Smith as very careful with his money and he even describes himself as being “cheap” at one point. For now he lives at home with his girlfriend and five rescue dogs, hoping that he can repair his relationship with his family later on. Money is a powerful tool and if we use it correctly it can do great things: more time to spend on things that we really care about, early retirement, trips across the world. But it can also cause great burdens and stress even between people you were close with. You can see that this problem doesn’t just affect “regular” people it can also affect millionaire athletes as we see if the cases of Jack Johnson and and Tyron Smith. As a personal finance blogger the obvious focus of this blog is on money, but I want to stress that money isn’t everything and should be treated as a tool not an end all. I thought that these two articles were timely for the Thanksgiving and holiday time period, and hope that everyone takes some time to focus on what is important in their lives! Please check out the original article, though I may warn you at some parts the article gets “wordy” and difficult to read as the author tries to use a million metaphors and similes. It still drives home a good point when you get around that though. This entry was posted in Personal Finance by Debt Hater. Bookmark the permalink.